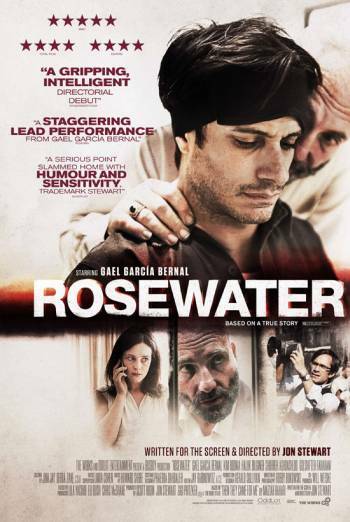 ROSEWATER is a drama based on Iranian-Canadian journalist Maziar Bahari's account of his detention and interrogation by Iranian forces on suspicion of being a spy. There is occasional strong language, including uses of 'motherf**ker', 'sisterf**ker' and 'f**k'. A character is detained by Iranian forces, who threaten to kill him. A character describes travelling to different locations to receive "sexual massages". There is violence when a character is beaten up. We also see bloody injuries as civilians protest in the streets. There is a scene in which a character imagines committing suicide by cutting his wrist with broken glass.